Limerick poems for children are some of the funniest, liveliest, and most creative poems written today. Kids both young and old love the limerick's predictable rhyme scheme and meter, which also make it a great challenge for them to try writing the poems. In addition, limericks are ideal read-aloud poems and can be helpful for teaching new vocabulary as well as getting kids interested in new types of literature. A limerick is a five-line poem with rhyme scheme AABBA. That means that the end words in the first, second, and last lines rhyme; and the words in the third and fourth lines also rhyme. The "A" and "B" end words may also rhyme with one another, creating a limerick with rhyme scheme AAAAA, but that is not very common. There once was a hippo named Tate. But sadly, he was underweight. He seemed to lose weight as he ate! A conventional limerick can have a rhythm like the one in the poem above, or it can simply alternate stressed and unstressed syllables. If your child is older and very interested in poetry, he or she may want to know more about the rhythm in limericks. Otherwise, don't worry too much about the rhythm in the poems you find or try to write; it's often more fun if you don't come up with perfect versions. Limericks are easy to find. 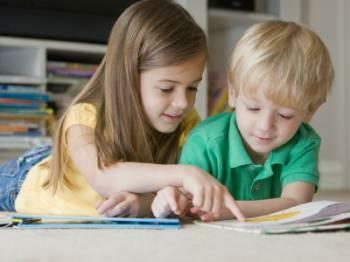 Once you've read quite a few of them with your child, try writing some as a collaborative effort. A few famous children's poets, such as Jack Prelutsky and Mary Ann Hoberman, who have both served as Children's Poet Laureate of the United States, have published volumes of their own poetry that include several limericks. If your child likes funny poetry in general and doesn't prefer limericks over any other kind of poem, share one of these books with him. A bookstore employee or librarian can help you locate poetry collections for children and may even be able to point out specific books that contain limericks. Teachers, poets, and librarians sometimes create kids' sites to host collections of limericks and other free poetry for children. The following sites are easy to navigate and a simpler alternative to searching for library books. Occasionally, limericks poems for children will show up in novels or in poetry anthologies, especially older anthologies. Since poetry appearing in novels is hard to find, ask a librarian to help you find books that fit into that category. Anthologies are easier to locate and a great resource for kids who like to write poetry themselves or read through many different types of poems in addition to limericks. Writing a limerick is a lot of fun. It's challenging to get the right meter and rhyme and keep each poem on topic, but if you've never tried before, you might find that composing a limerick is a little bit like solving a puzzle. After you and your child have read several limericks, each of you can try your hand at writing one. You can choose the same topic to write about or use different subjects, and then read your limericks to each other aloud. As you read more of them, you'll undoubtedly get better at composing your own. Save the limericks you write, and consider binding them into a book when you have enough.